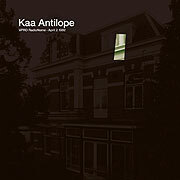 Kaa Antilope from Belgium is possibly one of the better kept secrets from the 1980’s. Known to few people but loved by those. The reason is simple… this band was unique with their wonderful neo romantic, playful and melancholy sound. Their songs are best described as experimental synthpop with a poetic touch. Only one 7″ record was released in 1982. Even today their music stands out with its very special sound of its own. There has not been a single other band since the 1980’s that can be compared to Kaa Antilope. This live studio session was done as part of the legendary RadioNome radioshow broadcasted by the VPRO in the early 80’s. The session has been tranfered from the original tape and is edited and re-mastered to make it available for the ultimate listening pleasure the songs ask for. The liner notes have been written by a close companion of the musicians / member of Pseudo Code. One of the musicians is now since years head of the great independent label Sub Rosa.